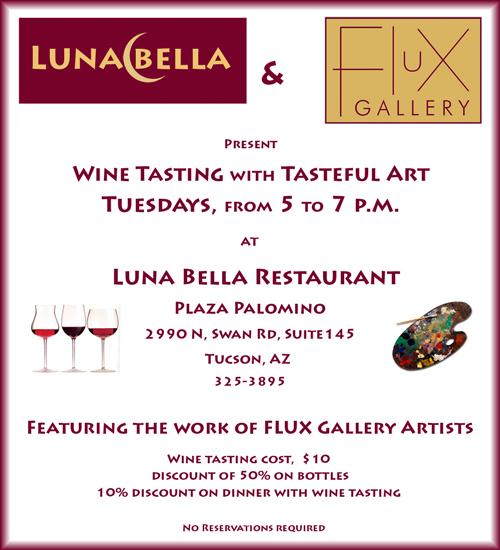 Flux Gallery is teaming with Luna Bella to present “wine tasting with tasteful art” on Tuesday evenings. 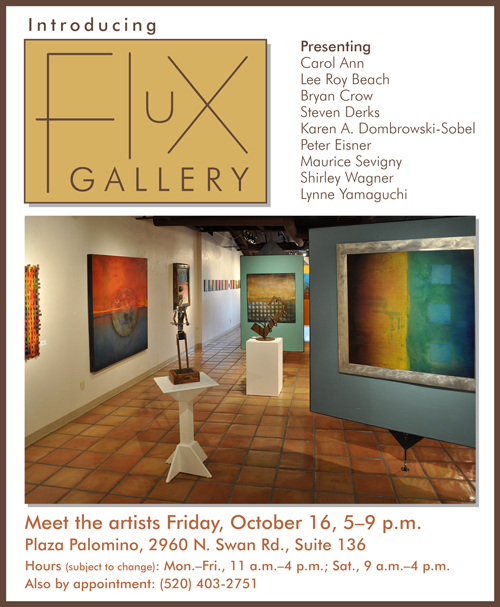 Each Tuesday from 5 to 7 p.m., while Luna Bella hosts a wine tasting, a Flux artist will present work at the restaurant, which is located down the plaza from the gallery at Plaza Palomino, in Suite 145. The artist will be on hand to chat about his or her work. I will be showing my work on May 25. In addition to my vessels, I have turned some bottle stoppers for the occasion, a new product for me. I’ve been having fun with it. You know, even with such a simple item, form matters! I will be using a newly learned technique with some of the stoppers as soon as my supplies arrive—I hope in time for me to put them to show them off on May 25! Is your interest piqued? It’s something entirely new for me! Karen Dombrowski-Sobel will be at Luna Bella tomorrow night, May 18. Lee Roy Beach will present his work on June 1. Hope you can join us one of these evenings! 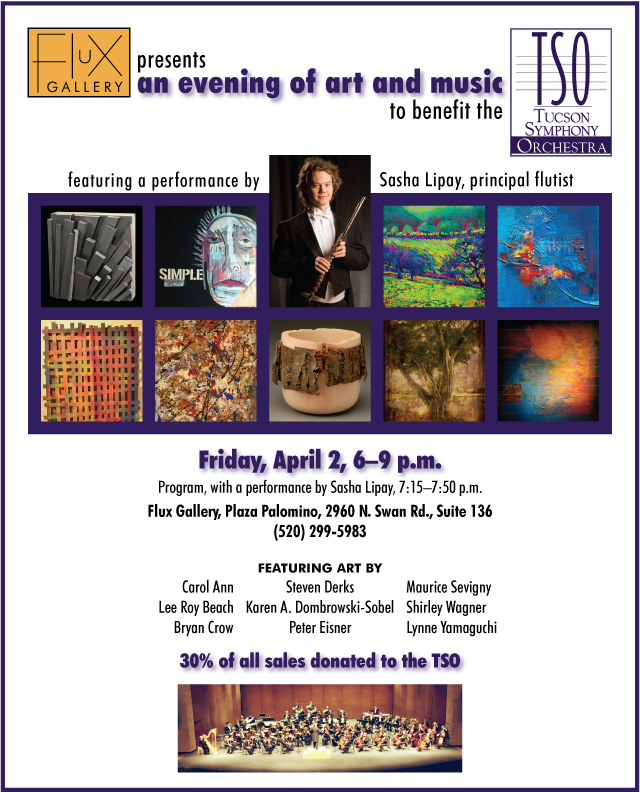 On Friday, April 2, Flux Gallery will host a special reception to benefit the Tucson Symphony Orchestra (TSO) beginning at 6:00 p.m. The reception will feature a performance by TSO principal flutist, Alexander “Sasha” Lipay. The reception and performance are free and open to the public. 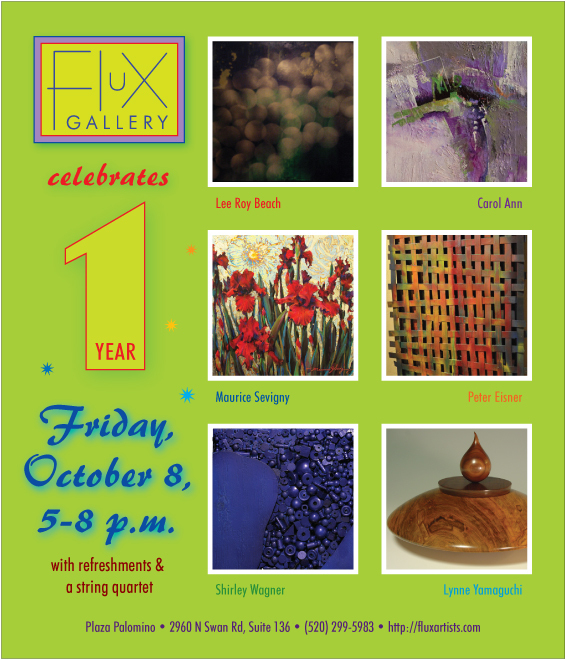 The artists of Flux will donate 30% of all sales that evening to the TSO (tax deductible to the buyer!). An open bar and hors d’oeuvres will be provided. Last week, I finished the last of my shows for this year, and, boy, was I exhausted. It has been a good season: my inventory is the smallest I think it has ever been, a good problem to have. Thanks to all of you who helped to make it a good season. I’m encouraged to think that the economy may be turning around with regard to art. I would refer would-be customers to my website, but I am woefully behind in photographing my newest work, so my work-for-sale pages are seriously outdated. In the downtime between customers when I work at Flux Gallery, I have at least started updating my (also long-neglected) photo galleries of past work. In the next couple of weeks, while I take a break from turning to finish the house remodels I have been putting off for much too long, I will set about photographing what remains of my newest work and updating my work-for-sale pages. And by January, I will be back in the studio, creating. 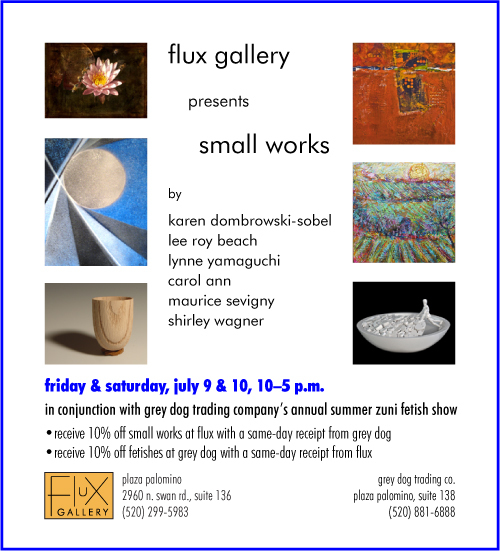 In the meantime, I’ve added a few pieces to the work displayed at Flux Gallery. In fact, all of us have just added or replaced work, so even if you’ve visited recently, it’s worth stopping in again. My fellow gallery collective member Bryan Crow is on television! Arizona Public Media has made a short video about Bryan, his art and his backstory. Check it out online, and share it with your friends. Figuring out the nuts-and-bolts of operating the gallery is a process, for sure. After a couple of weeks of being open a few evenings per week, to try to catch dinner customers from the two restaurants at Plaza Palomino (Luna Bella and La Placita), we have decided to shift to days, in conformance with the majority of the other businesses in the plaza. We are having to adjust our individual schedules to accommodate the change, so we may be a bit irregular for a little while, but we are trying to have the gallery open now Monday through Friday, 11 a.m. to 4 p.m., and Saturday, 10 a.m. to 4 p.m. Every Saturday there is a farmers’ market at the plaza (with an increasing emphasis on art), so we want to be open then, as well as during special events, such as the upcoming Southwest Flair A-Fair, a three-day art and crafts festival sponsored by Big Brothers Big Sisters of Tucson. That will be October 30 through November 1. More on that as we get closer to it.